It came almost from nowhere but suddenly, on Wednesday morning, I decided to get a new laptop (or notebook, if you prefer). The next morning, yesterday morning, a kindly courier arrived with my big red book. It’s a Samsung Q35 Red. Actually it is anything but big and it’s only red on the lid. I’ll tell you what it wholly is, though, it’s one fantastic little machine. My old laptop has served me well over the past few years but after an unfortunate incident, when it sucked down the best part of a pint of orange juice, it hasn’t quite been the same since. It was a stupendously expensive laptop, even for the time, coming in at just over £3,500 – it was a full on desktop replacement, with a large high resolution LCD panel (1600×1200 – still very good even being almost exactly five years later), 768MB of RAM, 100GB HDD, GeForce 4 Go graphics card. This was a machine that was up there with the best desktops of its day. What it isn’t, though, is small or light. I still carry it around with me, to work every day or when visiting friends or family – you never know when you might need a computer! It is a little too bulky for carrying around as hand luggage on these smaller aircraft, though. Another issue is that the triple damned orange juice damaged the power circuits in some way so that I can no longer run the laptop off battery. None too handy. The lid/screen is also a little loose now and prone to falling back if I push the angle too far – I have to really slouch down to avoid pushing the screen too far back when it’s on my lap now. Still basically works when tethered and on a desk, though. All in all, the Dell Inspiron 8200‘s traveling days are coming to an end. It has served me well. So, planning ahead, I decided that now was the time for a replacement. Last time I wanted an all singing, all dancing laptop with the power to take me out of the computer room and into the TV room. I also wanted a laptop I could play the latest games on. The Inspiron was all that and more. This time, though, I wanted something smaller, lighter and with even better Linux support (the Dell was great for all but the WiFi card – every time I installed a new Linux distro it was a huge hassle to get the WiFi going again). A fairly cursory search for available ‘ultra-portable’ notebooks at the local PC World superstore initially led me to a Philips notebook. Further investigation suggested significant issues getting it to even boot under Linux (the smaller the notebook the more exotic the hardware is a general rule of thumb – new and exotic hardware is generally less well supported under Linux as the manufacturers usually only release drivers for Windows). Other notebooks/laptops were either too expensive or just too big (the cheapest laptops tend to be quite large it seems). So much for nipping down to PC World at lunchtime to buy one. Next it was online. 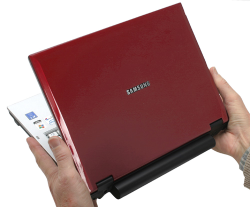 Quite quickly I noticed the Samsung Q35 Red – Core 2 Duo 64bit dual core CPU, 160GB HDD, 1GB RAM, 1200×800 widescreen LCD screen, WiFi, Bluetooth, integrated Intel graphics (this is no games machine this time – I have desktop machines (plus a Wii and a DS) for that). Cross checking Linux compatibility came up good too – it looked like the only thing I’d need to do is download and compile the Intel WiFi drivers. Easier than messing around with installing Windows WiFi drivers under Linux as I have to with the Inspiron. So, paying about double what I hoped – £809.98 (still a heck of a lot less than £3,500!) I ordered it. It arrived promptly in the morning. Sadly things were even more manic than usual in the department so I didn’t have a chance to do anything more than unpack it to make sure all was present and correct. Lunchtime was a long time coming, both because I was too busy to take lunch at the normal time and the added urge to just start playing with my new toy! When it did come, at about 15:00, I grabbed my things and rushed home – I’d never get peace at work that day. First priority: get Windows ready to share the drive with Fedora 7. I uninstalled various bits of junk that came preinstalled in Vista (including a 60 day Microsoft Office trial – I didn’t even bother to start that up). I don’t know if it was Sumsung or it’s a standard feature of Vista but one thing I really liked when I first started up was the offer to resize the two partitions it already had. Vista’s boot partition went down to about 40GB and there was a 10GB restore partition that I decided to leave alone for now. That gave the ‘D’ drive just over 100GB (of a nominally 160GB drive) – ideal for Fedora 7. This was my first real play with Vista, though all I really used was the Disk Management (to delete drive D) and the Uninstall control panel item. So far, so good. Vista appeared nothing more than XP with a slightly less Fisher Price graphical theme. Really nothing to get excited about – all those years of development, all those missed release dates for this? Probably unfair for me to really say much more at this point as I haven’t given it a decent play yet and aren’t intending to anytime soon. It’s there if I find I need it. X86_64 Fedora 7, downloaded a week or so back (before I had any idea I might have a new laptop soon), went into the DVD drive (a dual layer rewriter, no less – better than the DVD-ROM/CD-RW mutant in the Inspiron) and immediately up came the installer – and correctly into widescreen, too (I had expected the installer to be stretched and perhaps have a widescreen issue with the final install too). What an excellent start. 64bit Linux, here I come (I should note that I noticed in My Computer in Vista that Windows appears to be a 32bit version, goodness knows why they didn’t install the 64bit Vista). Outside of Red Hat Enterprise Linux on various servers, this was the first time I’d really used a 64bit PC. Of course you can’t really tell any difference as a desktop user but I liked the idea nonetheless! Fedora correctly suggested it take the free 100+GB for itself. The Fedora installation just keeps getting smoother and smoother. Any idiot should be able to install Fedora these days! I left the laptop installing as I had to return to work (I considered bringing it along but it would have been too much of a distraction). Got home about an hour late that evening, thanks to a web conference call, to find the machine sitting there ready for a post install reboot. Hit the ‘reboot’ button, up came the familiar GRUB boot loader and I decided to first go back into Vista. It came up fine, my fears of dual boot issues with Vista were unfounded. Immediately rebooted into the new Fedora 7. To my amazement everything appears to work. The screen looks great in widescreen splendor. The sound worked fine. The touchpad was okay. The built-in multi-card reader worked straight off, as did plugging in a USB memory stick. Even the WiFi just worked – no need to recompile or even download the firmware from Intel – it just worked. Everything just worked! I’m still amazed even now. If I had reinstalled Vista, as may have been required to get the dual boot working, I seriously doubt everything would instantly work without having to dig out driver CDs or perform Windows Updates. It really is a testament to Samsung for their decent hardware choices and to Linux for just how far it has come these past few years. The Samsung Q35 Red and Fedora 7 are made for one another! I haven’t had a chance to actually test it (as I don’t have anything to connect with) but even the built in Bluetooth has been recognised. I really am very, very impressed. Thank you Red Hat, thank you Linux hackers and thank you Samsung. I expect to have many years of fun on this little computer – orange juice allowing. I had my first app at the Gym today and decided to walk across the strip of green from the estate to the new lesiure center (which I still say shouldn’t have been built where it is). Anyway, I knew there was a bit of greenery, nothing much, I thought. However, on the way back, I decided to exsplore slightly. So, I need to get myself either an I-pod or a portable cd player so I can pop over there with a book during the day and soak up the peace and quiet….’cos it will, hopefully, do me some serious good. Incidently, I found this as someone’s avatar on the Jealhimet forum and was reminded of a certain Wii game..